As the 2018 year comes to a close, The Arc of Somerset County is working with our service recipients and their families on structural changes with fee for service. With these changes come growth opportunities as well as some shortcomings with our current funding for programs within our Adult Recreation Program. This year, we are focusing on our priority needs. For the adults that we serve, it is imperative that we continue support the health and wellness to our Arc adult population as they age. The opportunity for exercise, recreation and community interaction is vital to their quality of life and allows adults we serve to enjoy all that our communities have to offer. Often these activities require some level of funding and unfortunately, this funding usually is depleted by the end of each calendar year. An adult recreation fund has been established for this purpose and we look to our neighbors, friends and families to help support a full and active lifestyle for the adults with disabilities that we serve. As we move forward into 2019, our limited financial resources will continue to be stretched thin and will impact all of our programs and services for the individuals we serve. 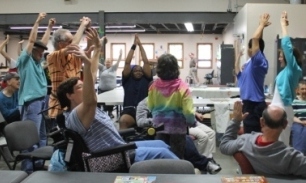 To support The Arc of Somerset County and help us secure recreational funds for the upcoming year, please make your donation through our website or make a check payable to The Arc Foundation of Somerset County, 141 South Main Street, Manville, NJ 08835- Attention: Adult Recreation Fund Campaign. Thank you for your commitment to help The Arc of Somerset County’s Adult Recreation Program continue into the New Year! May 2019 bring you much health and happiness from our Arc family to yours! We hope you consider The Arc in 2018 and know that you can help us make a difference as you contribute to the “Health and Wellness” curriculum for the individuals we serve who are living with intellectual and developmental disabilities. Wishing you and your family a happy and healthy New Year! Thank you for all that you do for The Arc of Somerset County. Do you shop on Amazon? Now those shopping trips can support The Arc of Somerset County as well. Use this unique link before adding items to your cart and 0.5% of the price of your eligible purchases will go to The Arc of Somerset County. Happy Shopping!